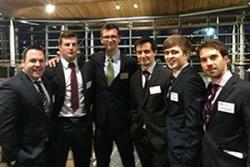 Left-Right are both School of Psychology team members: James Gilespie, Bryan Walls, James Gudgeon, Jamie Muir, William Morgan and Manuel Calatrava ConesaTwo teams of Consumer Psychology masters students went to Cardiff recently to participate in the Chartered Institute of Marketing's "Pitch" competition. The teams were: "The Three Marketeers" (Jamie Muir, Will Morgan, Manuel Calatrava Conesa) and "The National Thrust" (James Gudgeon, James Gillespie, Bryan Walls). Each team had three minutes and eight slides to address a marketing challenge posed by The National Trust: "How can we increase volunteering of 16-25 year old people?". The judges were impressed by the insights of the Bangor teams which drew heavily on the in-depth understanding of Consumer Psychology the have acquired during their studies. The National Trust have asked "The Three Marketeers" for additional consulting time after the event and the other Bangor team "The National Thrust" were picked to be one of the three finalists to present in the Senadd building. The National Thrust" did a fantastic final presentation, unfortunately they just lost out to a team from Swansea. If they had taken first place, this would have been the second year in a row that Bangor Psychology won the competition: which would have been another nice first in what is the department's 50th Anniversary year. Runner up James Gudgeon said ""Brolio/ The Pitch event was a great opportunity to apply the skills I've learnt on the Consumer Psychology masters in a competitive environment. Reaching the finals was a great experience and one that will no doubt provide a beneficial edge when it comes to applying for work in the future." Echoing that sentiment Bryan Wells said "I would recommend that any student, regardless of what they are studying, whether they are at undergraduate or postgraduate, to take part in the pitch. Not only will you learn a lot of valuable skills, but you will have great fun in the process, and end up with a fantastic addition to your CV." 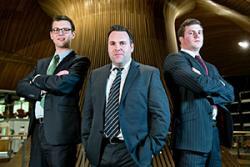 Left-right: James Gudgeon, James Gilespie and Bryan Walls the team who made it through to present their 'Pitch' at the Senedd. Image credit Chartered Institute of Marketing Dr James Intriligator (team academic lead and Senior Lecturer in Psychology at Bangor University) said "I was incredibly proud of how well our teams performed: their ideas were truly innovative and they presented them with brilliance. This experience will no doubt also be invaluable on their CV and will no doubt improve the employability of all those involved."